Scragged has written from time to time about the need to ensure that voters are qualified to vote. There are precedents for setting some kind of voting standards - most states bar convicted felons from voting on the grounds that they have demonstrated enough lack of responsibility to society that they can't be trusted with the vote. We've explored what those standards might be and have made some proposals, but voting qualifications aren't really on mainstream media radar at the moment. This is a shame, because right now the very most fundamental concept of voter qualifications is under assault. Our second-newest Supreme Court justice believes that it's wrong to bar felons from voting, no matter how heinous their crime. Any number of commentators are agitating for non-citizens to be allowed the franchise, and evidence is avalanching of Democrats involving illegal immigrants in political activity. These moves are not only in entirely the wrong direction, they're potentially disastrous to the very concept of a popular democracy. We have an idea about voting qualifications on which everyone of good intent - though, these days, that's quite a heavy caveat - ought to be able to agree. Before we describe it, let's look at history for a much-needed reminder of why we need voting qualifications and some mechanism for enforcing them. Tammany Hall, otherwise known as the Society of St. Tammany, the Sons of St. Tammany, or the Columbian Order, was founded in 1786. It became a highly corrupt but highly successful Democratic political machine which controlled Democratic party nominations from 1854 until 1932. As Democrats of today are associated with donkeys and Republicans with elephants, Tammany was associated with the tiger. 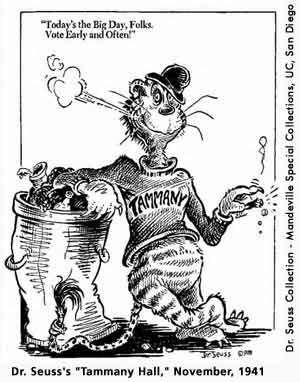 This was because Thomas Nast drew cartoons often showing Tammany as a fierce tiger, killing democracy much as later Democratic-leaning groups like ACORN try to subvert the electoral process in modern times. The most famous of the corrupt Tammany leaders was William "Boss" Tweed who based his power on patronage and graft during the mid 1800's. His period was so corrupt that "Tammany" and "Boss Tweed" have become by-words for political chicanery, corruption, misgovernment, and ill-gotten gains. Tammany's abuse of the political system had a profound influence on politics in the Far West, particularly California. One of the reasons the mayor of Los Angeles has traditionally had so little power is that at the time LA was being incorporated, its city fathers had become so disgusted with Democratic machine politics back east that they vested most power in the city council instead of in the mayor. The idea was that this would prevent the existence of one all-powerful political boss; unfortunately, the only resulting difference seems to be multiple corrupt and overlapping political bosses in the same corrupt political party, which was not a notable improvement. The Democrats of Tammany Hall perfected the techniques of swamping their opponents so that they could get the wampum. And get the wampum they did, on an epic scale! Harry Golden grew up on the Lower East Side of New York City and experienced Tammany government first-hand. He later moved to North Carolina and founded a newsletter called the Carolina Israelite. It functioned somewhat like a personal blog, but he had to type it, print it, and mail each issue to subscribers who valued his writing enough to pay for it. Big Tim's greatest contribution to Tammany power was his organization of "repeaters." He had hundreds of Bowery bums organized on one or two places on election day, and he waited for the reports - "The Fifth District needs two hundred," etc. - and as each "requirement" came in, Big Tim dispatched a truckload of the required number of bums to the polling place where a henchman went down the line and gave each the name under which he was to vote. The names were usually those of voters who had died between registration day and the election, or of voters who had not yet voted an hour before the closing of the polls. Even in that day, New York City recognized that the election commissions had to have some control of the voting rolls. There were lists of eligible voters, but there were so many voters that the people in charge of the polling place didn't know who they were. In those days before drivers' licenses or routine photography, the bums merely had to give the name of someone who was on the list who hadn't voted, and their vote was counted. Big Tim also had about fifty student barbers working for him on election day. Those barbers performed a great service for Tammany. Here is how it worked. Along about August, Big Tim sent word around the Bowery flophouses for the bums to let their beards grow. 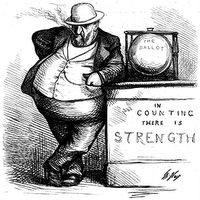 By election day, Big Tim had at his disposal several hundred Bowery bums, each with a full-grown beard. First, each bum would vote with the full beard under one name. He would then rush to one of the stand-by barbers who immediately clipped off the chin fuzz. So then the bum voted under another name with sideburns, like the Emperor Francis Joseph of the Austro-Hungarian Empire. Then he would rush back to the barber who shaved off the sideburns, and now the bum would vote for the third time with just a mustache; and finally that came off and he would go to vote for a fourth time - plain-faced as Tammany called it. For this day's work, the bum got one dollar, three meals, a pint of whiskey, and, of course, a lesson in civics and good government. The dollar each bum received was more money than it seems. The US Government inflation calculator only goes back to 1913, but it says that $1 in 1913 is the equivalent of $22.06 today. Assuming that the meals and whiskey cost about the same, Big Tim got 4 votes for $40 in today's money, or $10 each. This compares favorably with the $60 each vote in the California Republican Primary cost Meg Whitman, but Big Tim seems to have had the advantage of operating without scruple or media scrutiny. This cynical manipulation of the voting lists in the past and the vast damage the Democratic machine has inflicted on New York City over the years ought to be an unforgettable cautionary tale. Given this experience, one might think that we could all agree that one absolutely necessary qualification for a voter would be the ability to show that the voter was eligible to vote. Even in Tammany's day, there were official voting lists and a voter had to be on the list of eligible voters, but Big Tim and his bums showed that a mere list is not enough. A voter should also have to show identification to show that his personal self corresponds with the name on the list. One might think we could agree on this qualification, but one would be utterly wrong. Requiring voters to show identification turns out to be highly controversial - from the left, of course. It comes as no surprise to find that Republicans are on the side of voters having to identify themselves and Democrats are utterly opposed. Prop 200 requires voters to provide proof of eligibility (i.e., citizenship) to register and proof of identity to vote. Against precedent, statutory language, and logic, the 2-1 majority insisted that these eminently reasonable state requirements had been superseded by a federal statute, the National Voter Registration Act (NVRA), which does not mandate them. It is true that the Federal NVRA does not mandate proof of eligibility as a condition for voting, but it authorizes states to require "identifying information... as is necessary to enable the appropriate State official to assess the eligibility of the applicant." Despite this clear language, the court ruled that because proof of eligibility was not mandated by federal law, Arizona law couldn't mandate proof of eligibility either. Strictly speaking, this isn't a decision by the 9th Circuit because the deciding vote was cast by Sandra Day O'Connor, who recently retired from the US Supreme Court. She claims the power to sit in on cases in the federal, appellate, and district courts despite having retired from the Supreme Court; the legality and wisdom of this practice is beyond the scope of this article, but in this case the result is transparently indefensible if not traitorous. It's clear that liberal activists want their cohorts to follow in the steps of "Big Tim" Sullivan and bring in as many ineligible voters as needed to swing close elections. The fact that the People of Arizona wanted their voting to be limited to people who could prove their eligibility matters not a whit to O'Connor or her un-American leftist allies; true to their long and sordid heritage, the Democratic (but intensely un-democratic) goal is to get as many votes from whatever source counted as happen to be required to get the right (that is, Left) result. We seem to recall that the Republicans had a majority in the House and Senate at a time when they also controlled the White House. For reasons obscure, they didn't establish clear requirements that only eligible votes be counted when they had the chance. They've left the door open for liberals to pack the ballot boxes with ineligible Democratic votes. That's why we call Democrats the "Evil Party"... and us, the "Stupid Party." Let's hope they're stupid as well as evil tomorrow, and their plans somehow go awry - no thanks to our side.